In 2011, SMUD (Sacramento Municipal Utility District) began construction on its East Campus Operations Center, a net zero Platinum LEED® energy site containing a five-story office building, fuel and storage areas, maintenance space, shops and felt parking. Platinum LEED® (Leadership in Energy and Environmental Design) designation is the highest issued by the U.S. Green Building Council. 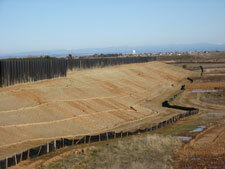 The worksite, prior to construction, was located in a flood risk area and required a flood wall. SMUD and the project’s engineers, Bohler Engineering, wanted a versatile solution which was non-corrosive, possessed an extended life cycle and reduced carbon foot print while contributing to the site’s durability. The product they selected was CMI’S UltraComposite™ UC 95 profile sheet piling. Installation Contractor Blue Iron, Inc. utilized sheets which were 30 feet in length. A medium weight excavator with a vibratory hammer was responsible for the driving of 100 feet of sheet piles daily into the rocky and challenging soil at depths of 17 feet with 13 feet exposed for flood protection. CMI's UltraComposite™ UC 95 profile sheet piling was manufactured in Strongwell’s ISO-Certified manufacturing facility to ensure consistent high quality, design strength, durability, cost and sustainability. By using UC 95, CMI was able to reduce both product and installation costs while generating further interest in the utilization of American-made composite sheet piling. To view the complete case study, click here.